Chicks: Did one of the babies fall from the nest? There are 5 nestlings in this photo. Can you find them? Question: Help! I’ve been watching the webcam and I can’t see all the babies! Did one of them fall out of the nest? Help! Answer: Don’t panic. They’re fine. Peregrines nestlings at two weeks old begin to move off the nest scrape and sleep in the corners of the nest box. 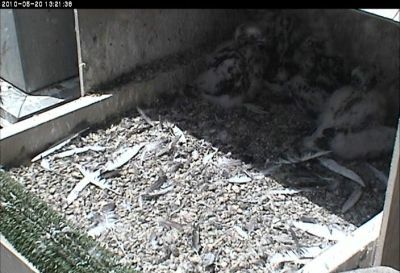 At four weeks old they are almost invisible in bright sunlight on a messy nest. By then their salt-and-pepper feathers match the gravel/debris and they tend to flatten themselves on the nest surface when they sleep in the heat. At five to six weeks the youngsters will be brown and easy to see but at that point they’ll begin exploring out of camera view. When they do, they may even jump out of sight. The first time you see a youngster do this you might think he fell from the nest but this is not the case. The camera view is narrow and there’s a lot of territory for the youngsters to explore. Even when young peregrines are on an edge that looks impossible to humans, the birds are OK because they hang on with their sharp talons. So don’t worry. Peregrine youngsters don’t commit suicide. But they must leave the nest when they learn to fly. If you want to see where the Pitt peregrines when they walk out of camera view, come to Schenley Plaza for Fledge Watch. We’ve been watching alot these days and love seeing the Gulf babies getting bigger too. Our Cathedral group are really testing their wings now and their interactions are so much fun to watch — especially when everyone’s running around and flapping at the same time. Seeing different personalities is a wondrous sight. Thank you for the information!! I hoped as much, but it is good to have it confirmed by someone who knows. Four of them are lined up facing the back wall. They look like they’ve been in trouble! Also, the chicks at the Gult Tower are so cute as they peak out from behind all the greenery! They look like they’ve been in trouble but they’re trying to stay in the shade. It’s hot out there today. It sure is hot out there today. What do they drink? They get the moisture they need from what they eat.